November 3, 2018, aged 100, peacefully, at Ballyclare Private Nursing Home, formerly of Hillmount Avenue, Ballyclare, beloved wife of the late Joe and devoted mother of the late Stafford. At her own request, a private funeral has taken place. 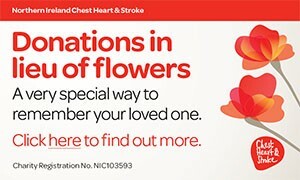 If desired, donations in memory of Rita may be made to the Alzheimer's Society, c/o Fleming & Cuthbert Funeral Directors, 141 Mill Road, Ballyclare, BT39 9DZ. Always loved and remembered by her daughter-in-law Lynda, grandsons Nicholas and his wife Kate, Jamie and his wife Philippa, also great-grandchildren Poppy, Joe and Charlie. I am sorry to tell you that MARGARET ELIZABETH (RITA) MITCHELL has passed away.